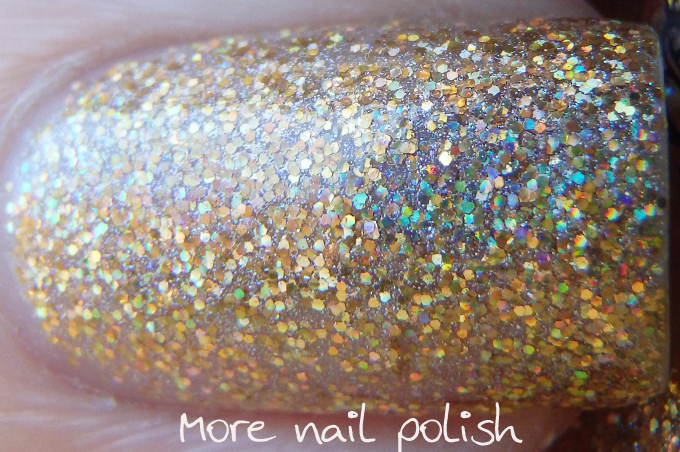 I have a few Enchanted Polishes, the Beatles Collection and the ones with the colour shifting glitter like the Ozotic Elytras - all in the round bottles with the paper printed labels. They were sent to me for review about two years ago, back before the brand became uber popular. These day's Enchanted Polish doesn't need multiple bloggers to share swatches before they go on sale, because they sell out in about 30 seconds anyway. A year later I purchased my first EP in a square bottle, which was Austin Powers, and I picked it up on a blog sale for a rather pretty penny. 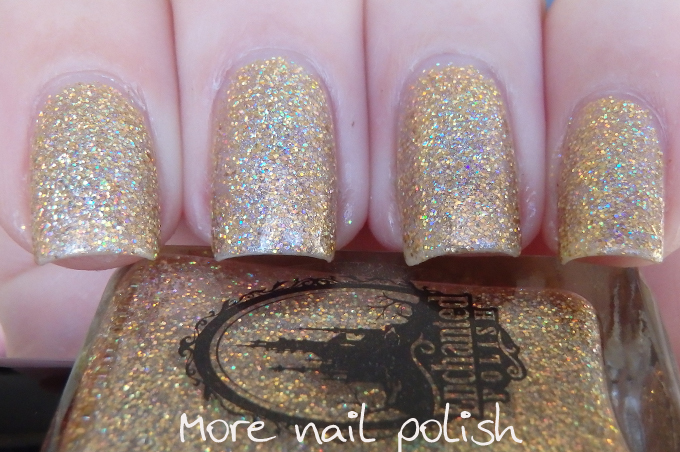 I'm certainly not one that gets drawn into the hype of a brand, but I do love me some gold polish, so when I saw that there was an Enchanted Polish restock that had two new gold polishes, I decided to give it a go. If you've never attempted to purchase from an EP restock, well let me tell you they are quite a frenzied thing to participate in. I set my alarm for 4.55am on the Monday (which was 11.55am Sunday US time for the launch). At 6.00am I started the mad refresh waiting to see the polishes in stock. When they appeared, I quickly added the two I wanted to my cart and checked out. Lots of people missed out, so I'm amazed that I scored the two I wanted - the two golds. 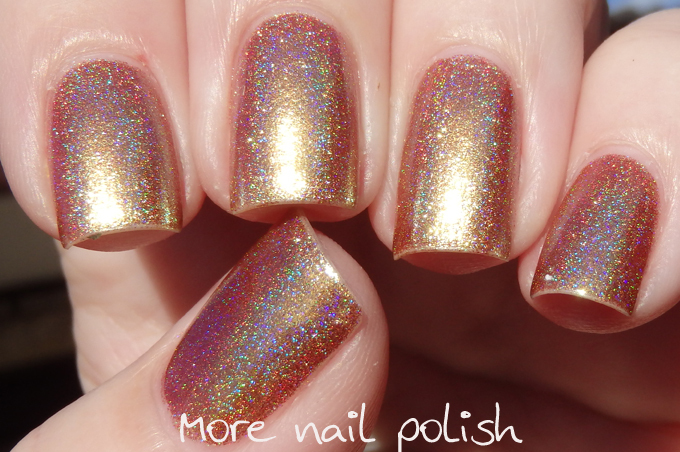 Flashing Lights is a gold holographic polish with gold holo glitter and linear holo pigment. It really is beautiful and a total 'me' polish. The funny thing was, the weekend before my polish arrived in the mail, I was over at Hayley's place (eg Emily de Molly) regaling my story of how I manged to score two Enchanted Polishes, when she explained to me that from looking at the photo she saw, it looked like a mix of Spectraflair and the Gold Galaxy holo from Glitter Unique in a clear base. 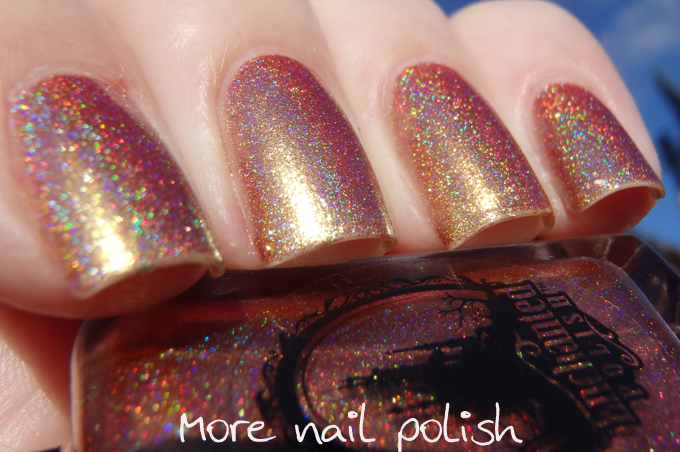 She then pulled out a bag of Gold Galaxy holo and the moment I saw it I knew it was the same. 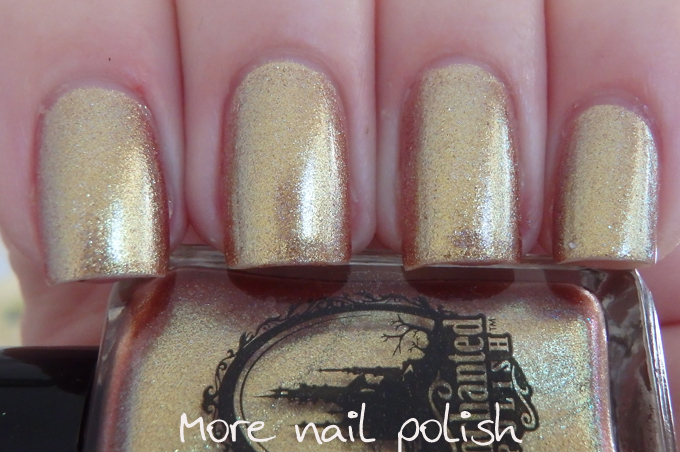 We then mixed up some bottles and yes, I had just created a dupe for this polish before it even arrived. Doh! Not that it matters to me, Flashing Lights is still gorgeous and I bought it cause it's exactly the sort of polish I would happily wear every day for the rest of my life. This is three thin coats with Seche Vite top coat. 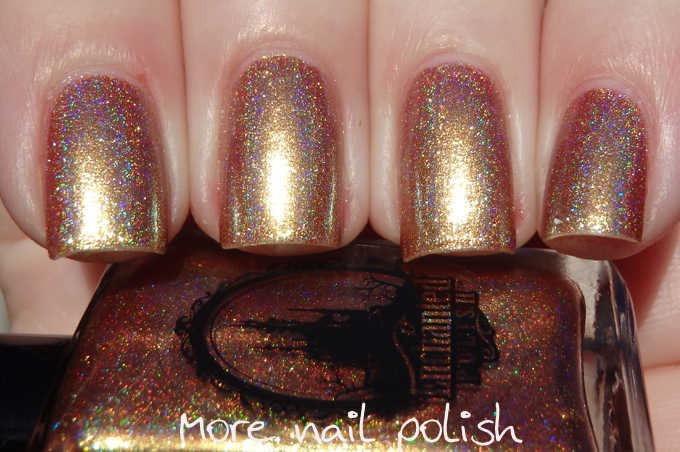 Good Life is a warm metallic gold with linear holo. In the full sun it leans bronze, almost orange. Indoors, and in the shade, Good Life is actually much cooler toned and it has a slight duochrome finish to it. It's quite the chameleon. The golden flakes actually remind me of the ones in OPI Golden Eye. 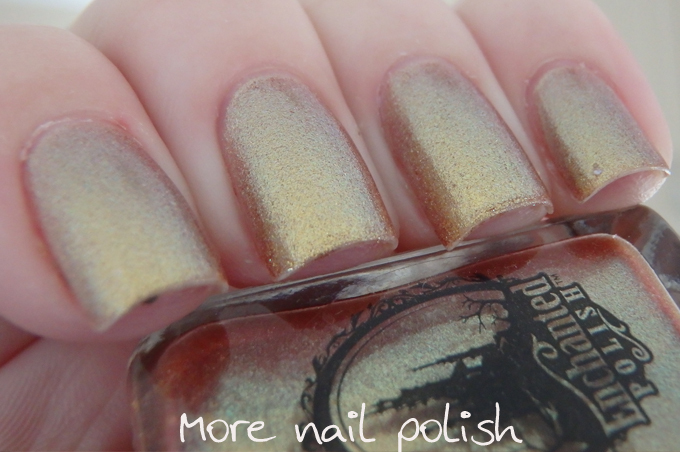 Who out there is an Enchanted Polish lover? It's such a shame that the polishes are so difficult for people to purchase, which then causes a secondary market of those people who purchase just to on sell at a higher price. I'm glad I bought these ones, but I will certainly continue to be picky about which restocks I will bother with. 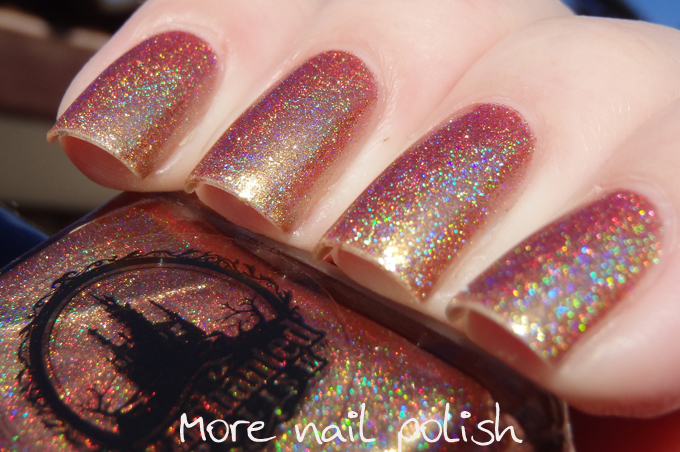 I love Enchanted Polish but attempting to buy them is so crazy! I bought one a while back from a stock by Mei Mei's Signatures, and I was extremely lucky to buy the one. All the other polishes sold out while I was putting just the one in my cart. It's bananas. Good Life is so pretty in the shade but I'm not a fan of it in the sun. 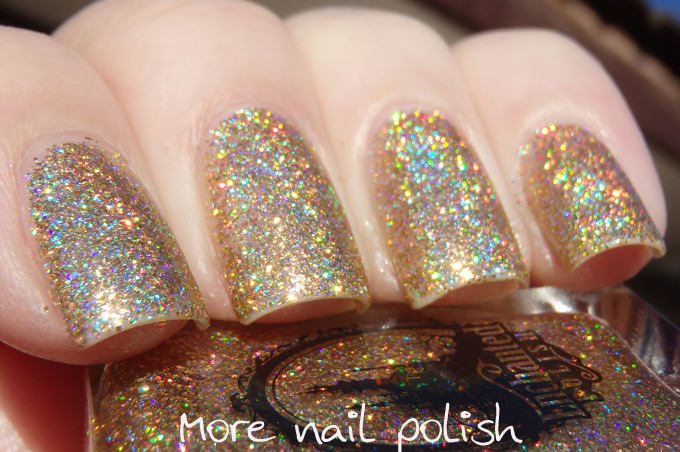 Flashing Lights would be perfect for a New Year's themed manicure! So blingy! I wanted to buy the Flashing Lights. But it is impossible to buy, always sold out the good colors.